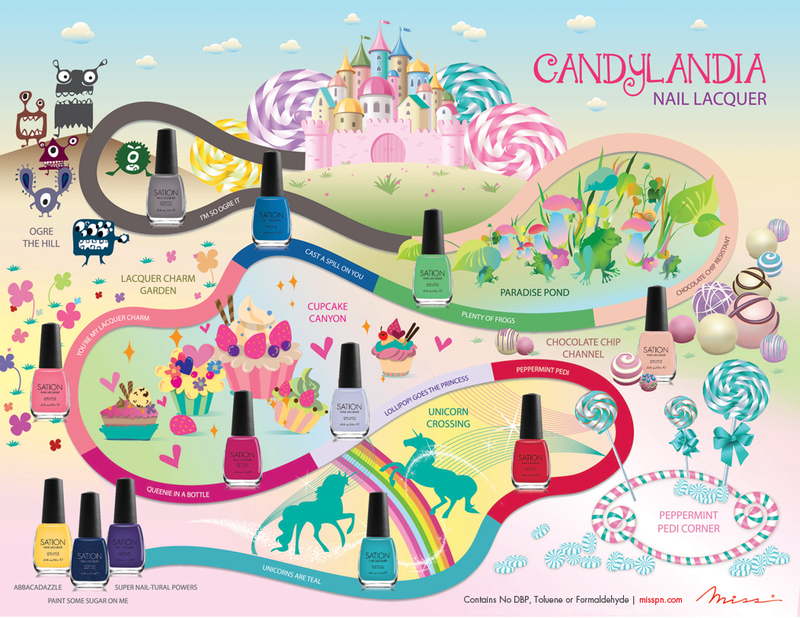 Miss Professional Nail (Miss) has announced the launch of “Candylandia,” their Limited V nail lacquer collection. The flavored, fantasy-themed line presents 12 candy-coated colors with a mouth-watering range of confectionary names. Candylandia was inspired by the edible escapism of Hasbro’s Candy Land board game, a classic favorite spanning six decades. Miss loved the bright, playful visuals of the swirly rainbow board, which sparked the creation of its own irresistibly sweet polish palette. This whimsical collection offers winning colors that will stir up memories of childhood imagination and endless game-playing. Embark on a magical, manicured journey filled with fun characters and luscious lacquers. Sweeten up your new year when Candylandia hits the shelves this January. Polish players, take your places at the Sation starting line! Queenie in a Bottle: Blink blink blink for this royally rich pink! You’re My Lacquer Charm: Cross your fingers and flash this pop-rock pink for good luck! All Miss products are free of DBP, Toluene and Formaldehyde. I discovered them sometime late last year, and fell in love with the Sation polishes! This blog was created as a companion to Chalkboard Nails to provide the latest nail polish and nail art news for people that want to stay in-the-know. The posts on this page are prewritten press releases provided by the manufacturers. They do not necessarily reflect the opinion of Chalkboard Nails. Zoya Promo - Shine in 2013! Chalkboard Nails 2012. Simple theme. Powered by Blogger.